Built as "Stadthalle". Later renamed "Montforthaus" in honour of the Counts of Montfort who founded the city of Feldkirch. The complex includes two halls: "Graf-Hugo-Saal" (used for congresses, concerts, and various performances; up to 1160 seats) and "Graf-Rudolf-Saal" (used for congresses, lectures and exhibitions; up to 290 seats), as well as various conference rooms. 2001-2012 also used for performances by the annual "Feldkirchfestival". 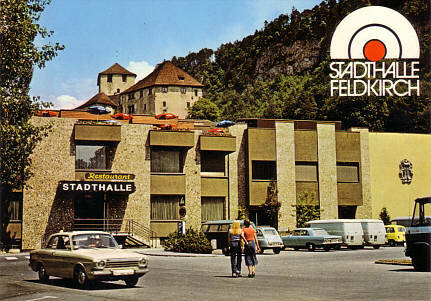 Front Text: "Stadthalle Feldkirch", signs: "Restaurant", "Stadthalle"
Reverse Text: "Vorarlberger Veranstaltungscenter - Stadthalle - A-6800 Feldkirch"